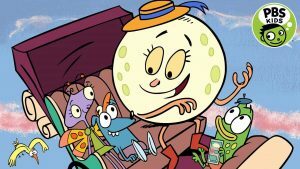 HARTFORD, Conn. – PBS KIDS has announced the premiere of the new animated series Luna Around the World, produced by 9 Story Media Group and created by Emmy-winning animator, writer, and artist Joe Murray (Rocko’s Modern Life, Camp Lazlo). This new multi-platform series will debut nationwide in fall 2018 on CPTV and other PBS stations; on the new 24/7 CPTV PBS KIDS channel; and on PBS KIDS digital platforms. With a social studies curriculum, Luna Around the World will encourage kids ages 4 to 7 to explore and appreciate cultures from all over the world, and build global citizenship and social skills. The series follows the adventures of three friends – Leo, a wombat from Australia; Carmen, a butterfly from Mexico; and Andy, a frog from the U.S. – as they traverse the globe with their parents’ traveling performance troupe, “Circo Fabuloso.” At each of the Circo’s stops, Luna the moon guides the trio as they experience the local language, music, and daily life. Also in fall 2018, the series will offer digital content for kids, parents, and teachers. It will be available on pbskids.org, the free PBS KIDS Games App, the PBS Parents site, and PBS LearningMedia. Additionally, a Luna Around the World app will be launched.